Info "Here's the secret of walking the tightrope: Stop when you start to lose your balance. Simple isn't it?" Going Steady is one of Wario-Man's microgames in WarioWare: Twisted! 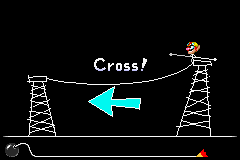 The player must use the Game Boy Advance's tilt to help Wario cross a tightrope. Wario can go only when the arrow appears. Level 1: The tightrope is low, thick, and short. Level 2: The tightrope is higher and easier to lose balance on. Level 3: The tightrope is very long, high, and thin. This page was last edited on September 20, 2018, at 09:36.